There is a right triangle ABC with ∠ABC=90°. 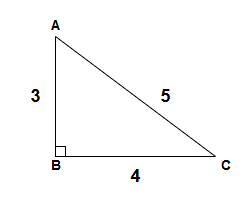 Given the lengths of the three sides, |AB|,|BC| and |CA|, find the area of the right triangle ABC. It is guaranteed that the area of the triangle ABC is an integer. The area of the triangle ABC is an integer. Print the area of the triangle ABC. This triangle has an area of 6. This triangle has an area of 30. This triangle has an area of 630.